Dreamstime.com is a stock photo agency which provides you with high quality photos. This website has a large photo selection at affordable prices for designers. 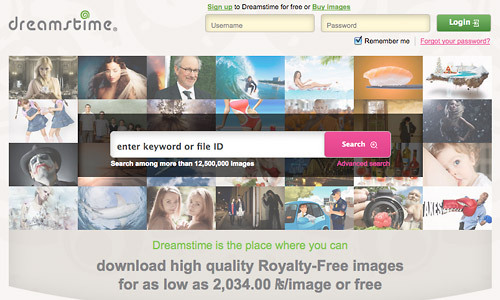 Use the Dreamstime promo code below to get 3 free credits to purchase stock photos today! If you want to purchase some of the photos, all you need to do is buy some credits and by the way the more credits you buy on a one time deal, the cheaper the credit gets. The credit cost starts at around $19.99 which is equivalent to 20 credits and you can get it up all the way for $99.99 for 130 credits. In fact an image suitable for web publishing can be bought for 1 credit, while large images which will be use for large prints cost only 3 credits. Now see the huge difference in how much money you will save. On the other hand, if you are not opting on buying credits on a one time deal, you can also buy a monthly subscription to the site. Dreamstime has provided an exclusive offer for Vector Diary readers. Now you can simply click the link to activate the Dreamstime coupon to get 3 free credits! Sign up today and see how easy it is to find quality stock photos! Dreamstime Promo Code Activated. Sign up now to enjoy one week free trial. 5 free credits when you sign up when you sign up with this coupon. Send a tweet about dreamstime. How to Use Dreamstime Promo Code? Simply click the link above to claim your Dreamstime promo code. Next sign up at Dreamstime and you will receive the 3 free credits. It’s remarkable to visit this site and reading the views of all mates about this paragraph, while I am also eager of getting experience. this subject? I’d be very thankful if you could elaborate a little bit further. Thanks! Hi colleagues, fastidious post and pleasant urging commented here, I am truly enjoying by these.